Simply Earth Essential Oils has really changed my approach to oils. I grew up with a massage therapist as a mother. Oils were around the house all of the time, tea tree oil consistently being my favorite. For years, I knew I wanted to start incorporating essential oils into my daily routine. The older I get, the more I want to reduce the chemicals I use in my home and on my skin. This kept steering me right back to essential oils. What is Simply Earth Oils? Simply Earth Essential Oils is a family-owned company who simply wanted to cure their daughter’s stinky feet. Like me, they were tired of chemicals and the cost of oils. They kept running into the problem of not being able to find quality oils at a price they could afford. It was thrilling to know that this company set out to fix a problem that was keeping so many of us from using oils: THE PRICE OF OILS. For the longest time, I was buying oils from places like Walgreens and it was just BAD! I knew there had to be a company out there selling great, pure, honest oils at a fair and honest price. Simply Earth Essential Oils has cut out the middle man and achieved this goal. With Simply Earth Essential Oils, you’re not just simply changing your home, you’re being the change. Simply Earth recognizes that, in a sense, they’ve become part of the beauty industry for young men and women alike. Because of this, the company donates 13% of its profits to fight to end human trafficking for those whose beauty has been unfortunately and unfairly abused. Each month a different organization is highlighted by the company to raise awareness of the facts of human trafficking. Did you know the average age of an individual forced into exploiting their body through human trafficking is 13? If you’d like to read more about this wonderful cause and company, click here and/or here! I’ve always had migraines. The older I grew, the worse and more intense they became. At some point, I went to a specialist who gave me Rizatriptan (a common migraine pharmaceutical) to take, as needed. The Rizatriptan was supposed to be taken once I received the first aura signaling I was getting a migraine which. For me, that was flashing in my eyes. I took the prescribed Rizatriptan twice during my first aura and decided I just couldn’t do it anymore. The medicine made me feel unbelievably nauseous. I stopped taking the Rizatriptan and started getting a massage once a month. Long before I started massages or tried Rizatriptan, I sat down to do some research on essential oils for migraines. I read that peppermint was one of the best oils to help migraines. I can’t tell you how happy I was when I found Simply Earth Essential Oils Peppermint to accompany my sessions! My massage therapist would rub the oil into my scalp, temples, and shoulders and I’d leave feeling lifted and balanced. She’d also use lavender on days my shoulder and neck were particularly tight. I now use Simply Earth Lavender on my face and neck every night! I’m not going tell you that Simply Earth is the only pure, honest, fair essential oil company out there. There are other great companies that might fit your needs better. Maybe you’re currently with a company you love and that’s great! What I will tell is you why I chose Simply Earth over the other companies. Small, Family-Owned Business: Both of my parents have always been self-employed with their own businesses. I mentioned earlier that my mother has always been a massage therapist and entrepreneur. My father owned his own computer business. Obviously, there’s a soft spot in my heart for small and/or family-owned businesses. Simply Earth was created because a pair of parents had a problem that they needed to solve and they solved it. In turn, they found a way to help hundreds of other people, too. Great oils at a fair, honest price. Simply Earth Essential Oil Recipe Box: I’m no oil genius or aromatherapist. I can’t tell you what every single oil does. Actually, almost every time I want to use oil for something I have to look up which one to use and why. That’s how we learn, or at least how I’ve been learning. I’d argue to say that the best way there is to learn about essential oils is through Simply Earth’s Recipe Box. When I found this box I was ecstatic! It was the cherry on top and from that day on I became a dedicated Simply Earther. Over the flippin’ moon, Y’all. What is the Simply Earth Essential Oil Recipe Box? The Simply Earth Essential Oil Recipe Box is a subscription box you get once a month with 4 oils, information on what those oils are and how to use them and materials to make different recipes with those oils! For example, this subscription box will teach you how to blend oils for different ailments such as a cold and this box will provide you with the materials to make your own DIY chapstick or deodorant! How cool is that? I use oils multiple times a day in my household now to clean with, treat toothaches, headaches, etc. Another great thing about the subscription box is that you can freely pause your subscription, change your subscription from monthly to quarterly, and customize your box by choosing different oils to receive if you already have the ones pre-planned. 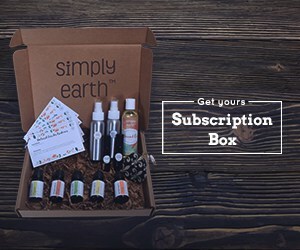 If you’d like the try out the Simply Earth Subscription box, click HERE and use my code TGAHFREE to receive your BONUS BOX and a $20 gift card that you can use towards any purchase! Then let me know what you think about the box! Simply Earth Essential Oils provides a “Comparison Blends” list for folks transitioning from doTerra or Young Living to Simply Earth. They also provide a free, downloadable Essential Oil Dilution Rates Guide in order to ensure you’re safely and properly using your oils in addition to the free, downloadable eBOOK from Simply Earth’s website called “Essential Oils for Beginners“. To top that off, you can also earn countless coupons from leaving reviews on the products you order! With every purchase, they email you an offer to earn a 10%, 15%, or even 20% off coupon just for leaving an honest review. On every bottle, the label tells you the origin of the plant, which part the plant the oil was extracted from, what aroma to expect, and the ingredients. Most of the bottles even have a “Child Safe” label, telling you which age child the specific oil is safe to use on. Every question I’ve asked Simply Earth, I’ve received a transparent, honest answer and great customer service. 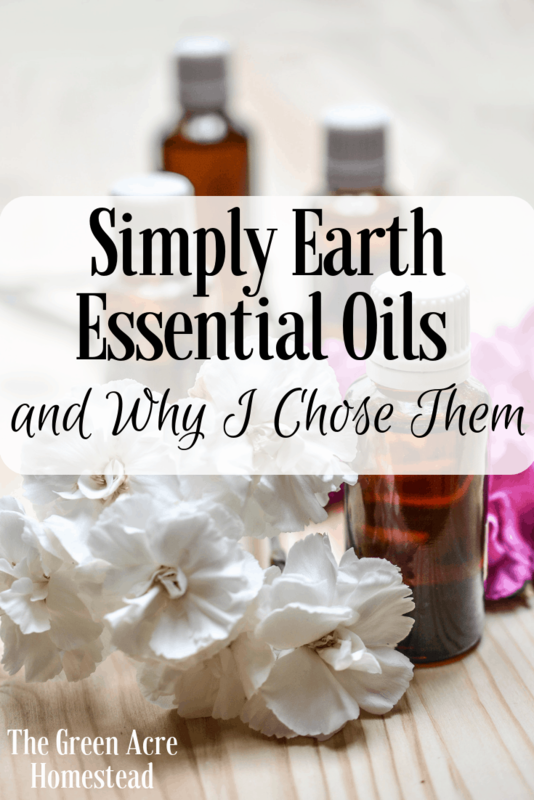 These are my reasons to using Simply Earth Essential Oils. Are you ready to have a natural home? I’ve also been on a Zero-Waste journey! Read about it HERE.